We use our in-house facilities to print all hard copy music ordered on our website and to serve the print/ship needs of external composer/arrangers such as Wycliffe Gordon and Andrew Boysen. We are accepting new Print and Ship service clients for a limited period of time. Simplify your life – Avoid trips to the copy center, stop dealing with print counter personnel that don’t know the difference between a quarter note and a quarter keg! Reduce equipment/supplies cost and clutter if doing your own printing – paper, toner, binding, envelopes, packing slips, machines, etc. Color or grayscale covers on white, 80lb card stock. Black and white score pages on Tabloid, Legal, Concert or Letter (depending on score size) white 28lb paper. From octavo to tabloid and every size in between. Saddle stitched binding for smaller scores. Black spiral coil binding for larger scores. On a per piece basis….we charge you 20% of your list (i.e. non-discounted) price or $5, whichever is higher. Includes paper, printing, binding, covers, packing materials…all materials and labor. If the piece has no price or is under-priced, we will determine a fair market price. There are no setup fees, no handling fees and no imposition fees. There is $75/month minimum spend with us, which is prepaid prior to month start. This the amount of print/ship charges, not the sum of the retail prices. The $75/month minimum is applied each month, regardless of spend levels in past or future months (there is no “carry over”). We may offer a la carte pricing in the future for lower volume customers. If your print/ship cost in a given month is between $75 and $125, the difference will be billed at the end of the month. If the print/ship cost in the month exceeds $125, the overage will be billed and due prior to any more music being printed. We charge you $6 for USPS standard shipping to the US per order. You can charge your customer whatever you want for shipping. After your first payment to us, we will share a DropBox folder with you to add COPIES or your scores, parts and covers you need us to print. Each piece should have a unique catalog number as indicated in the file names. If you don’t have a cover, we can create one for you for an additional fee. Your scores/parts should be “print ready”; we do not adjust or fix the engraving, page turns, etc., though this is available at an extra cost. As we are operating a printing service, we don’t charge or collect sales tax, even if the “ship to” address is located in New Jersey, our business location. We provide one packing slip and can ship to a single address for each order placed with us. After the items ships, we’ll email the shipper’s tracking number to you. If your customer has a question on package whereabouts, you would be responsible for following up with the shipping carrier and customer. At the end of each month we will email to you detailed records of what was printed/shipped and costs. You can cancel your plan with us at any time by sending us an email. Charges will cease at the end of the calendar month in which the cancellation notice is received. We reserve the right to cancel your service at any time and would return any unused funds for the current month. We look forward to serving your music print/ship needs. For questions or to get started, email us at info@artofsoundmusic.com. This entry was posted in Print and Ship and tagged Print, Ship on March 21, 2018 by Ed Hirschman. 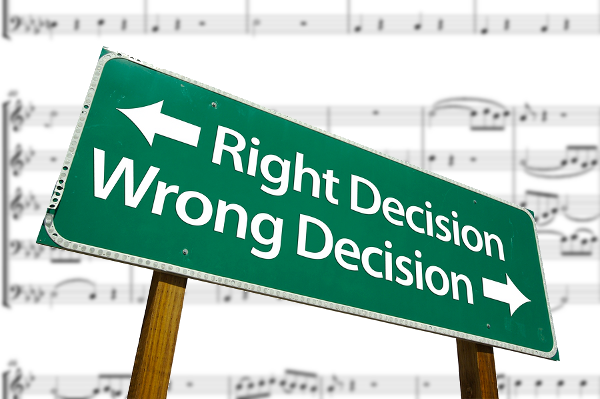 When it comes to publishing sheet music, “to err is human; to correct divine.” A first edition of sheet music can contain errors such as wrong notes, wrong clefs, incorrect rhythms, bars with incorrect numbers of beats, articulation problems or difficult page turns…the possibilities for trouble are endless. When scores and parts contain thousands or more elements, it is almost inevitable that errors will exist. Composition step – the composer may have had sloppy handwriting or written in some wrong notes by mistake, missed rests, added extra rests or had clef issues. If the composer uses notation software, this reduces but doesn’t eliminate the error potential. Arranging step (if there is one) – arrangements and transcriptions can easily introduce new errors such as missing accidentals, wrong notes, etc. Engraving/Copyist step – he/she can misinterpret what is received or introduce errors in a variety of ways. Printing step – Error prone as well. For example, the print shop may start a part on a right page that was intended for a left page start, thereby creating a bad page turn. How do errors get detected? For many years now, sheet music has been computer notated with the ability for the person inputting the notes to listen to what has been entered. I encourage publishers to use the playback capability in their notation software to find mistakes…in tonal music at least where mistakes are relatively easy to discern. Art of Sound Music has certainly found mistakes this way that we would not have found otherwise. Players, groups and conductors are pretty good at finding mistakes in printed music. Luckily most are found at rehearsals, but some only at the performances, especially when rehearsal time is minimal. Despite all of the opportunities to find and eliminate errors before they get to paying customers, errors do get onto the final sheet music…and quite a number of them. I queried my friends on the Sibelius music notation program chat board and they offered plenty of examples (publisher names removed to protect the guilty)! The problem is so widespread that a book was written on the topic by Norman Del Mar called Orchestral Variations. How do publishers learn about errors in their editions? Sometimes publishers are notified by their customers about mistakes. For example, I play in a brass quintet and we recently played an arrangement published in the 1980s. I found a wrong note in the trombone part and contacted the publisher by email. The publisher responded that the wrong note was present in the source material and engraved faithfully. NO ONE HAD EVER CONTACTED THEM about the mistake despite the arrangement being very popular and the error there for decades! How do publishers handle the errors reported to them? Some publishers don’t fix mistakes because they don’t know about them. Others choose not to fix them. In some cases the original scores are lost and can’t be easily updated. Some publishers do very large print runs and don’t want to throw away that investment, so they keep selling the printouts that have mistakes. How do publishers notify existing customers about reported errors and fixes? Most publishers are unable to contact their customers because they sell through distributors and don’t know who their actual customers are! 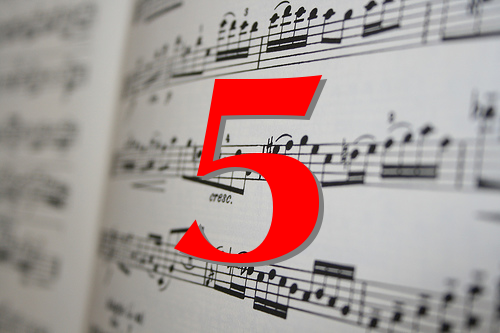 A handful of publishers and composers maintain “errata lists” on their websites for some works they publish, but this requires the customer to proactively go to the publisher website. Independent entities will also maintain errata lists but these options are not all public, convenient or known by most people that could use the information. For example, the errata lists in the OMEC (Orchestra Music Errata Catalog) are only available on the private section of the MOLA site to MOLA librarians. How does Art of Sound Music avoid the pitfalls described above? There are no large print runs. When we make a fix, the very next customer to buy that piece from us (either hard copy or PDF) gets the corrected music. We have all the original notation files (or can quickly get to them) such that reported errors are fixed on a timely basis. We place a very high priority on addressing known errors and do it quickly. Most of the people playing our publications buy directly from us, so we know how to reach them and vice versa. Customers that bought a certain piece get an email from us with a list of all corrections, and if they bought the PDF version, they get a brand new PDF by email with all of the fixes incorporated. This process works like self-updating software such as Apple iTunes, but applied to sheet music. Our website address appears on the bottom right corner of every piece we publish and on the sheet music cover. Customers can easily contact us via email about any problems they find. We give customers an incentive to report errors (besides feeling like a good Samaritan). They get a 10% discount off sheet music on their next order. As you can see, the ability to get correct and corrected sheet music varies on the publisher and their business practices. Publishers like Art of Sound Music have a direct relationship with their customers and do everything possible to provide trouble free, accurate sheet music before AND AFTER your purchase. This entry was posted in General, Music Engraving, Music Notation and tagged notational errors, Sheet Music on April 25, 2015 by Ed Hirschman. At Art of Sound Music, we don’t just publish and sell sheet music, but are musicians ourselves. I find that organizing printed sheet music for gigs, storage and musician folders is error prone and time-consuming. One thing I do to make this easier and faster is to use a database to keep track of which titles I have in my library and make sure each has an ID number (“Chart number”) assigned. These numbers appear at the top of the first page of each part. This system allows me to create, search and copy/edit prior programs to easily and quickly create new ones for upcoming performances (perhaps I’ll do a blog posting on this process for a future blog post). 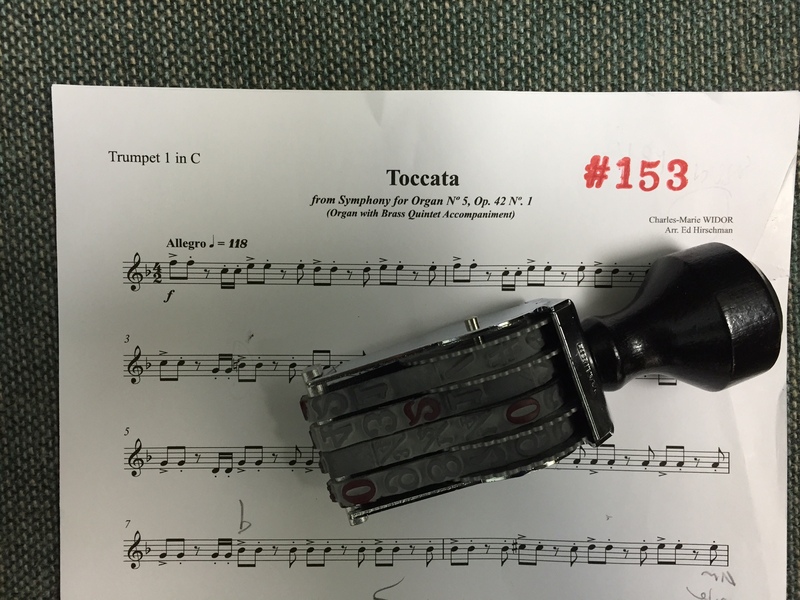 Here’s an example of a trumpet part with a chart number stamped across the top. This is all well and good, but I wanted to buy an actual stamp to number my purchased music and PDF music that I print out. I wasn’t able to find such a stamp even though I consider myself a pretty good web searcher. Luck had it that I stumbled upon one of these stamps in the choir loft on a church gig I did earlier this month. I quickly snapped some photos as a way to start to unravel the mystery. The stamp had no visible model number, but did show the manufacturer name (Pullman). Armed with this information, I found the manufacturer’s website. 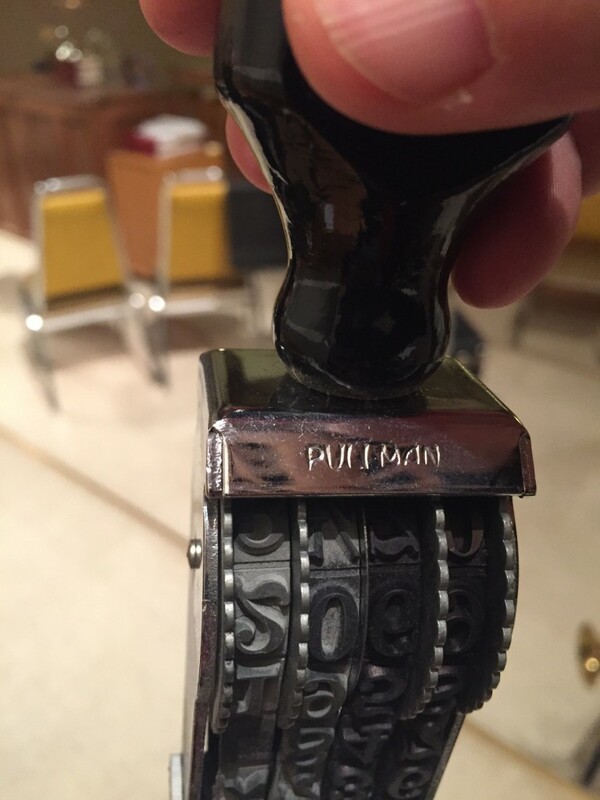 Although the name on the stamp is Pullman, the manufacturer’s name is actually Cosco (not the warehouse club). Unfortunately, their site was not up to date and almost useless in finding out more about the stamp. There is an extra cost option for metal wheels to switch characters on each band. The standard plastic wheels are fine for printing on paper, so save your money. Stamps are available with larger or smaller fonts, different typefaces and more/fewer bands. Some bands offer alphabetic characters. Call a distributor if you’d like to learn more. The ability to order online from the sites listed below runs from totally confusing to not available. I found it easiest to order by phone and chose The Huntington Park Rubber Stamp Company at (800) 882-0029. My order arrived quickly and below is my first attempt at using my new stamp. Although I wasn’t looking actively, it took me a few years to figure out where to get a stamp suitable for adding chart numbers to the top of music parts, because the information about this practice is almost non-existent. I hope anyone looking for a sheet music numbering stamp discovers this post to quickly and easily get the stamp they need. We’ve updated our ScoreFlipper links to feature cuts from the new Spanish Brass CD, SuBLiMe Christmas. Excellent and inspirational playing of some fun arrangements by Art of Sound Music arrangers. Six of the sixteen works on the CD are Art of Sound Music publications. To learn more about the CD visit www.spanishbrass.com. This entry was posted in Uncategorized on December 16, 2014 by Ed Hirschman. Art of Sound Music uses the Sibelius music notation program to engrave the scores we sell. To improve the quality and speed of publishing music, we use many Sibelius plug-ins to assist our work. and there are hundreds of them available (most provided by users). Plug-in removes the wiggly lines from selected trills in a score. Plug-in replaces trill symbols that don’t play back with trill lines that do playback. Allows you to add an authentic jazz articulation called a flip. Useful for parts with a length of two pages and for situations where starting a part on a left page offers the performer simpler page turns. This plug-in allows plug-in authors to create multiple backup snapshots throughout the plug-in development process. This plug-in adds a “chart number” at the top of top of each piece for working bands with a large number of pieces in their “book”. This entry was posted in Music Engraving, Music Notation, Plug-in, Sibelius on March 22, 2014 by Ed Hirschman. Several Art of Sound Music Composers/Arrangers are members of performance rights organization such as ASCAP (The American Society for Composers, Authors, and Publishers), BMI or GEMA. These organizations track music performances worldwide that provide a modest royalty reward that costs you nothing, but allows our Composers/Arrangers to continue creating new music for you to perform. The music we publish of this nature typically has a link on the bottom of the page pointing to our Performance Notification Form at “www.artofsoundmusic.com/notify” to let you know it was created by a member of ones of these groups. Thank you in advance for taking the time to do this and pay it forward. It will only take about 3 minutes of your time, but will will surely mean a lot to them, and will allow them to continue creating more music for you to enjoy. This entry was posted in Uncategorized on November 29, 2013 by Ed Hirschman. I recently visited the Retail Print Music Dealers Association website and made my way over to the copyright info page, where they summarize US copyright law in simple terms. I wanted to compare these somewhat restrictive Sheet Music Rights vs. the expansive rights you automatically get as an Art of Sound Music customer. You are not allowed to copying music for any kind of performance, with the exception of an "emergency". You may photocopy parts and scores you have purchased to serve as a backup copy, to accommodate extra players in your group on certain instruments and/or to give to group members to practice with at home. These rights are granted to the PURCHASING USER ONLY for your own group’s use. You may not copy and/or distribute parts to any other person or entity for any other purpose. You can do emergency copying to replace purchased copies which for any reason are not available for an imminent performance provided purchased replacement copies shall be substituted in due course. You may photocopy parts and scores you have purchased to serve as a backup copy, to accommodate extra players in your group on certain instruments and/or to give to group members to practice with at home. These rights are granted to the PURCHASING USER ONLY for your own group’s use. You may not copy and/or distribute parts to any other person or entity for any other purpose. In addition, we give free Part Transportation service and free Lost Part Replacement service. For more details visit our Parts Policy page. You may manually transpose parts to accommodate players with instruments in different keys than that supplied using the parts we’ve provided. Alternatively, we can transpose the part for you free of charge for scores we have in music notation format and that are still active in our catalog at the time of your request. If you’ve lost a part and don’t have a PDF and/or photocopy backup, we can replace the lost part free of charge if that score is still active in our catalog at the time of your request. The replacement part will be emailed to you. It is our intent to treat customers as trusted partners, not criminals. For this reason, copying of scores and parts are allowed for your own group. We think that the basic law is too restrictive and puts music directors in an unnecessarily awkward position. This entry was posted in Copyright, Uncategorized and tagged Copyright, parts, rights on October 27, 2013 by Ed Hirschman. 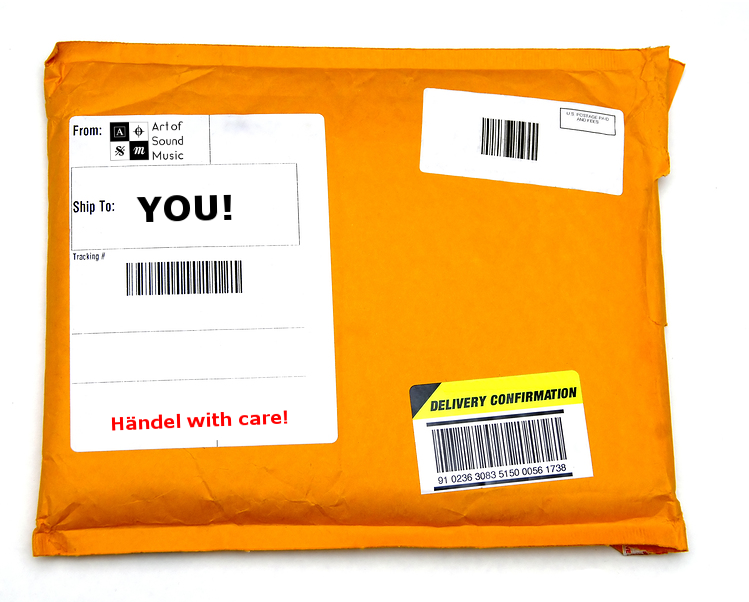 Several new shipping options are now available to increase the speed and convenience of ordering “Ship to Me” sheet music from Art of Sound Music. USPS (United States Postal Service). For customers outside the US, the package is ultimately delivered by your in-country postal service. Standard – The least expensive “1st class” type shipping that the carrier offers. Expedited – This is faster delivery than “Standard” and can cut shipping time by days or weeks, depending where you are. All shipping delivery time estimates are based on the date the package ships, not the date you placed your order, although these dates are often very similar, as nothing we offer on our website is ever “out of stock”. Package tracking is now included with every shipping option (except USPS to the United States). When your order ships, you will receive an email with a link to track the package online. You don’t need to memorize or type in the tracking number, just click on the link! To see our current shipping rates (based on the “Ship To” region/country), delivery speed and package tracking options, click here. We are glad to be able to offer customers the power to choose the shipping carrier and class of service options that best meets their needs. This entry was posted in General on August 29, 2013 by Ed Hirschman. Whether your group is brand new or has been around for years, there’s always a need for new brass quintet sheet music. New quintets need to quickly build a library, while established groups should be introducing new pieces regularly to create interest and variety for their audiences and musicians. It is also important that every group should challenge themselves to play more difficult and rewarding music, as well as music from unfamiliar genres. In the old days, I would look for brass quintet sheet music in the printed Robert King catalog and often find several editions available of the same work (with different arrangers with sometime wildly varying prices) and have no idea which to order. Was the most expensive version the best? There was really no way to know, so I’d make a selection based on how much money I had or if I recognized the arranger name. Regrettably, the situation is slightly worse today. The online version of that catalog only shows the name of the piece, and you need to click each record to reveal the arranger or publisher name. Who has time for that? Hoping to find a score sample or MP3…fuhgeddaboutit! It’s a shame because there are some real gems in that catalog. Unfortunately, without much information, some of the pieces I bought using this trial and error method turned out to be “clunkers”, which wasted my time and money. Despite the fact the many of the largest and best sheet music stores like Petelson’s in NYC have gone out of business over the last few years, the selection, pricing and availability of brass quintet sheet music has never been better. While there’s far fewer local shops where you can grab a chair and coffee to peruse a few brass quintet sheet music scores you’re thinking of buying, you CAN get the in-store experience at home…actually better (because not all of us have the ability to hear music in our heads just by looking at notes in a score). Websites with brass quintet sheet music like Art of Sound Music now provide rich and useful information such as the arranger name, grade of the piece, information about parts provided (and key of the instruments), alternate part availability, sound samples, visual samples and links to YouTube videos of performances. These resources are extremely helpful for deciding if a piece suites your needs, skills and taste. 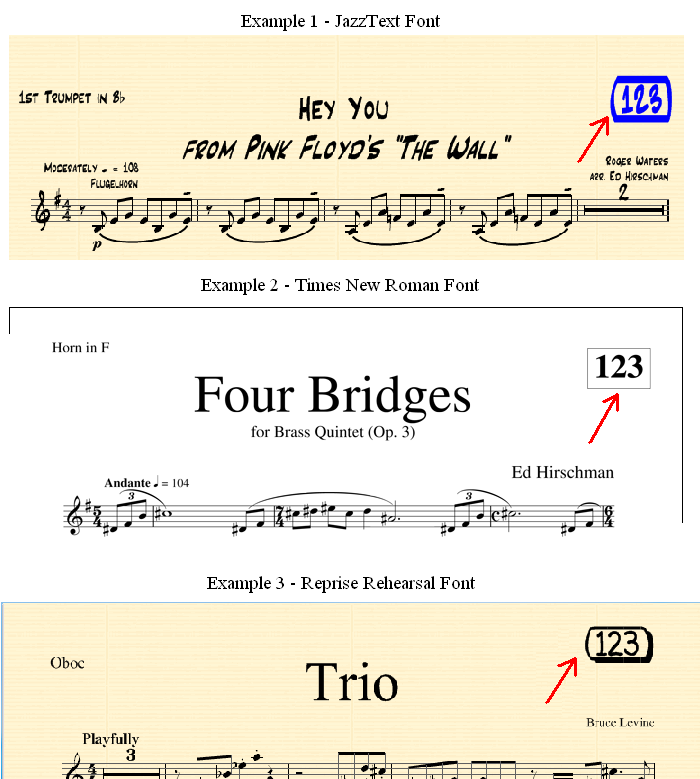 On our site, we go the extra mile by showcasing each piece of brass quintet sheet music in ScoreFlipper™, our advanced technology that allows you to thumb through an online musical score as if you were holding it in your hands, with the added ability to hear the music synchronized with the pages viewed. ScoreFlipper playback features actual live recordings when we have them, and computer generated ones where we don’t. People find ScoreFlipper extremely useful when selecting music as it removes the risk (that I mentioned above) out of the purchase process. Click to see ScoreFlipper in action with Tony DiLorenzo’s Fire Dance for Brass Quintet. Are you playing for kid’s concerts? Senior citizens? Patriotic events? Recitals? Each of these situations creates a certain expectation for the type of music played, but this doesn’t mean you need to be totally predictable. There are many resources available with excellent advice on how to program a concert. Visit Ryan Anthony’s blog for a list of standard brass quintet repertoire. You can “stretch” yourselves and the audience by introducing different types of material. Even a twelve-tone piece can fit into these performances if it is placed and explained properly. For weddings ceremonies, more and more pop music is expected (especially for the cocktail hour), along with the classics. An economically way to acquire brass quintet sheet music for weddings and other events is with large collections such as our Gig Ready™ Brass Quintet Libraries. If you are on a budget, this is an excellent way to quickly expand your repertoire and cover the basics. If the brass quintet sheet music site shows grade levels for each piece, be sure to check the legend as they are not standard from company to company. If your group has a non-standard instrumentation, check to see if alternate parts are provided or if the company will transpose parts upon request. There are many excellent arrangers in the brass quintet sheet music genre, such as Jack Gale and Ingo Luis…when you buy their music you can never go wrong. YouTube is also a great place to see brass quintet sheet music works being played and who composed or arranged them. Luckily, there’s no reason in 2013 to buy blindly anymore, so let your eyes and ears be your guide! This entry was posted in Brass Quintet Sheet Music and tagged Brass Quintet, Brass Quintet Sheet Music, Sheet Music on July 12, 2013 by Ed Hirschman. I previously wrote about how to obtain permission to arrange a copyrighted work. However, I didn’t discuss IF you should pursue it, and merely advised that “you need to see if their deal makes financial sense to you.” Today I’ll discuss how to determine the profitability of arranging a copyrighted work, by walking through a made up example modeled in Microsoft Excel. At the bottom you’ll find a link to download the example as an Excel spreadsheet, that you can use to evaluate almost any licensing scenario. We’ll start at the point in the process right after the copyright administrator has sent a contract to sign with their deal terms (3 year limit, etc. ), and I need to decide if I should sign the contract or not. In this made up example the work I’ll be arranging is Lady Gaga’s “Poker Face” for Bassoon Quartet. Cells with a yellow background are where I will type in my information; all other cell values will be conveniently populated by Excel formulas. Although this post is a bit long, the process below only takes about 5 minutes to complete! Sales Period: Since this is a 3 year deal, I entered 3 here. Average Discount to Resellers: If you sell some or all of your works through a reseller (e.g. Sheet Music Plus) put in the discount percentage off the consumer price that the reseller pays to you. For example, if the end customer pays $10.00 and you sell it to the reseller for $7.50, here you put in (10-7.5)/100= .25 or 25%. If you only sell directly to performers, enter zero. Hours to prepare: Estimate of the total hours it will take to arrange, engrave, prepare program notes, update web pages/products, read/sign the contract, etc. for “Poker Face”. The section calculates the overall estimated cost of accepting payments such as Credit Card, Paypal, Check, POs and “Store Fees”. Total Sales: Enter all sales subject to transactions fees for a given prior period, say last year. Total Transactions Costs: Put the total transaction related fees you paid during the same period, including credit card processing fees, store fees, gateway fees, etc. Transactions Costs %: This is your average cost of accepting payments. If you are new to selling and have no historical sales and costs data to reference, you can overwrite the calculation and type in your own estimate here, say anywhere from 2-10%. Sales Quantity: The estimated copies sold in the period. If you don’t plan to sell a particular “Type”, enter 0 in that row. Type: “Soft Copy/PDF” are sold electronically and printed by the customer. If you don’t plan to sell this Type for this arrangement, enter 0 in the Sales Qty field. Hard copies are traditionally printed scores. Note that some copyright administrators will not allow Soft Copy/PDF sales of any type. Channel: “Self” are arrangements sold by you directly to the musician with no company/middleman in between (e.g. Retail or Direct sales). “Reseller” is when you sell to a company (e.g. Sheet Music Plus), and they in turn sell the arrangement to a musician. Typically you get less for Reseller sales than Self sales. Average Revenue Per Unit: How much YOU will get on average when these items sell, considering any price changes, different configuration/instrumentations, etc. If you want to keep it simple, enter the current price. If you don’t sell products of this type, enter $0.00. Extended price: Calculated for you as is the total revenue across all sales methods. Example: I expect to sell 10 PDF copies @ $14.20/ea. and 6 Hard Copies @ $18.00/ea. directly to musicians, and 0 through resellers. This section allows you to get more specific (if you wish) with transaction costs previously entered in the Transaction Costs section. I kept things simple and accepted the 7.5% value it gave. Fixed cost per sale (Self): When you sell directly to a musician, if you’re charged a fixed price per transaction (say $0.10), enter that here. Percent of Revenue Per Unit (Self): When you sell directly to a musician, if you’re charged a percentage of the sales price, enter that here (or keep the auto calculated value). Fixed cost per sale (Reseller): Same as above, but for selling to a Reseller. Percent of Revenue Per Unit (Reseller): Same as above, but for selling to a Reseller. Gaga’s people drive a hard bargain! They’ve offered you a 3 year licensing deal, where you pay them 15% of the selling price for each copy sold and guarantee a minimum payment of $50 ($16.67/year), even if you sell no copies…and after 3 years, you are not allowed to sell any more. Flat Rate Licensing Cost: A fixed cost regardless of how many copies are sold. Licensing Period: In years. Enter 5 if there is no specified term. Per Unit Cost: A fixed price for EACH copy sold. Percent of Price: A percentage of the selling price for each copy sold. Minimum Fee: A minimum guarantee regardless of how many copies sold. Minimum Fee Guarantee Per Year: The minimum divided by the licensing period. Licensing Subtotal: The sum of all calculated costs. Total Licensing Cost per year: If the Minimum Fee is larger than the Licensing Subtotal, it will show the Minimum Fee here. Example: Gaga offered me a 3 year deal @ 15% of selling price with a $50.00 minimum spread across that time. When you use the spreadsheet to analyze your deal, enter values for all items that apply and zeros where they don’t. If you plan to pay someone to arrange the work or to use sales agents, enter those costs here. This section is similar to the licensing section in terms of possibilities In this example, I am the arranger and won’t use sales agents, so all values are zero. Flat Price: Lump sum payment to the arranger. Price per year: Flat Price divided by the selling period. Commission per Unit per year: Price per year divided by copies sold. Percent of revenue per Unit (Soft Copy/PDF) : A percentage to the arranger or sales agent for each soft copy sold. Percent of revenue per Unit (Hard Copy) : A percentage to the arranger or sales agent for each hard copy sold. Many of the values here are copied in from prior sections. Print Cost Per Unit: A place to enter your printing costs. Here my print costs are expected to be the same for Self and Reseller sales. If you don’t play to sell hard copies at all, set those to zero. Example: I used $3.15 as my print price. Yours could be higher or lower depending on the number of pages, page size, cover type, how it is printed, volume discounts, etc. After all of that hard work, we finally get to see our profitability! Profit Per Hour: The profit divided by time spent. Depending on other factors this can be inspiring or depressing. Remember, the minimum wage you can get flipping burgers is $7.25/hr! Average Profit Per Unit: What you’ll take home per copy sold after considering all costs. Gross Margin: Profit divided by gross revenue. To learn more about the significance of gross margin, click here. Total Profit: The amount you’ll deposit in the bank at the end of the sales period, after all costs are paid. Reduce printing costs by printing in bulk, changing your printing supplier or eliminating hard copy sales altogether. Try to increase your market so you can sell more copies. Arrange for a more popular instrumentation to increase your addressable market. Find a less expensive way to host your store or take payments. Even if you only arrange for the love of it, you shouldn’t be in the habit of taking a loss to do it. However some not so profitable arrangements can be useful when viewed as part of a portfolio and as a way to attract customers to some of your other pieces. I hope that this approach to understanding profitability of arranging licensed works was helpful. As you can see, you don’t need to have a Masters degree in Economics to see if a deal is worth doing, but it is helpful to understand a few financial concepts. You can download my Arrangement Profitability Calculator which contains the example I went through above. Edit the values in the spreadsheet to analyze your own deals. The spreadsheet can be used to forecast profitability (as I demonstrated) or to calculate actual profitability retrospectively. This entry was posted in Copyright and tagged Business, Copyright, Economics, Profitability, Publishing on May 13, 2013 by Ed Hirschman.